Husk tomatoes (Ground Cherries and Tomatillos) are covered separately. How to Grow: Sow seeds 6 weeks before the last frost date for your area. Plant seed 1/4 in. deep in shallow flats and maintain soil temperature in the range of 75-85 degrees F for good germination. When the seedlings have produced several leaves, transplant to 3 in. pots to promote root growth. After transplanting, keep seedlings at a lower temperature at night, 50-60 degrees F, to promote earlier flowering in some varieties. Day temperatures should rise to 75-85 degrees F to promote rapid growth. Expose plants to light and air currents to harden the plants and to encourage stockiness. Water sparingly, but do not allow the growth to be checked. Fertilize with complete, soluble fertilizer or fish emulsion if leaves become yellow and/ or purple. Keep phosphorous levels high. Too much nitrogen will delay fruiting. For transplanting to the garden, average soil temperature should be 60-65 degrees F.
Spacing: Staked plants should be spaced 24" apart. Caged plants should be spaced 36-48" apart in rows 60" apart. Diseases: Plant disease-resistant varieties for a sustained harvest. Leaf blight diseases such as early blight and alternaria begin to appear about mid-July, and plants are more susceptible once fruit production begins. To reduce disease problems, use resistant or tolerant varieties and rotate tomatoes to different parts of the garden each year, using a 4-year rotation. Mulching and caging/staking plants helps prevent disease. Fusarium wilt (race 1), a disease caused by a soil fungus, is common in the Mid-Atlantic region during mid- to late-season. Fusarium races 1 and 2 are present in southern regions. Where fusarium wilt is present a 6-year rotation or use of resistant varieties is recommended. Do not plant eggplants, peppers, or potatoes in wilt-infested soil during the rotation period. Avoid planting tomatoes near walnut trees to avoid "walnut wilt." Early blight and anthracnose are common in the Mid-Atlantic region, and are favored by hot, humid conditions. Late blight is more common in inland regions at higher elevations, especially during the spring and fall. Blossom-end rot is prevented by ensuring an adequate level of soil calcium and steady moisture. Pests: Tomatoes planted in healthy soil will generally have few severe pest problems. Foliage: Many heirlooms are "potato-leafed" - their leaves look like those of potatoes. Some folks think these larger leaves improve fruit flavor and aide pest control. Flavor: Type of fertilizer used has an effect on flavor. Highly flavored tomatoes are sometimes subject to "off flavors" under certain growing conditions. Avoid placing freshly harvested tomatoes in the refrigerator because refrigeration will destroy much of the delicate flavor. Tomatoes are best stored at a temperature above 50 degrees F.
Seed Savers: Isolate varieties of L. lycopersicum by a minimum of 35' for home use and 75' to 150' for pure seed. Isolate varieties of L. pimpinellifolium species from all other tomato species by a minimum of 150'. See our Illustrated Guide to Saving Tomato Seed for detailed instructions. Maturation: Days to maturity are the number of days after transplanting. Determinate vs. Indeterminate: Determinate varieties are short-vined plants that may not need staking, though yields will be much better if plants are staked. Indeterminate varieties are long-vined plants that bear fruit continuously. These varieties should be caged or staked. Some varieties are semi-determinate. Mulching: Too much mulch on the soil in the spring may delay growth by preventing soil temperature from rising enough to support active root growth. In June, apply a deep mulch around plants to conserve moisture, prevent disease, and increase yield. Yield: Too much nitrogen after transplanting will delay flowering. High levels of phosphorus are necessary to produce good yields. Pruning and staking increase early fruiting at the expense of yield. Indeterminate varieties may be pruned if necessary. Pruning of determinate varieties should be kept to a minimum. For largest yields, cages 2-1/2' wide by 5' tall are recommended for indeterminate varieties. Packet: Seed size varies considerably, 0.08 to 0.16 g (about 40-83 seeds, depending on variety, average 64 seeds) sows 100'. Currant Tomato Packet: 0.05g to 0.09g depending on variety. Canning varieties have firm, round fruits that are usually canned whole. Drying varieties are small, lowmoisture tomatoes well suited to quick drying. 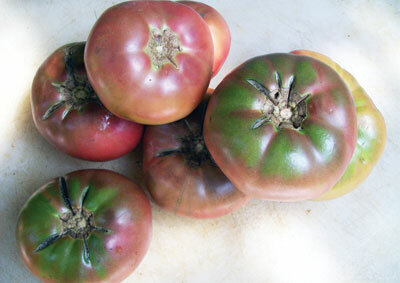 Paste tomatoes have thick, dry flesh with few seeds. Sauce tomatoes are more flavorful and have more seeds than paste tomatoes, and because they are juicier they need to be cooked longer to make thick sauce. Drying and paste tomatoes are more susceptiable to blossom end rot due to their low moisture content, so during dry spells provide adequate irrrigation and calcium. Though the quality of winter storage varieties doesn't match that of fresh garden tomatoes, flavor and texture is superior to most winter supermarket tomatoes. Best planted 1-2 months after the main tomato crop, timing the harvest for fall. Avoid watering plants in the 2 weeks before frost. Harvest unblemished tomatoes before frost. Dark green fruits won't ripen off the vines. Keep out of direct sunlight, ripen at room temperature or lower. Store so fruits aren't touching, and check for ripeness and rotting weekly. Used apple boxes with their fruit separators are convenient for this. Some folks wrap individual fruits in newspaper. One longtime grower says he prevents rot by regularly turning over the fruits so they ripen more evenly. 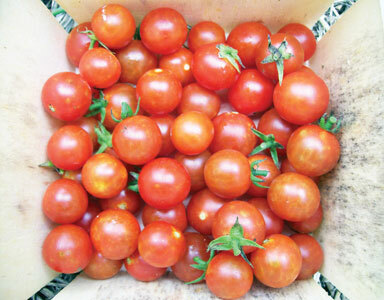 Currant tomatoes are essentially wild tomatoes, little changed by domestication. Vines are long and indeterminate with an open growth habit and generally good disease resistance. Fruits are the size of a berry, 1/2" to 3/4" in diameter. Flavor is intense, sweet and piquant. They are especially suited as salad accents and for the specialty restaurant trade. Seeds are small. 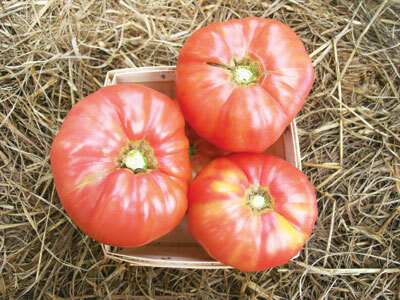 Greenhouse-grown tomatoes require pollination for good fruit set. Vibrate the blossom clusters with an electric toothbrush or tap them with a pencil. Daytime temperature should not exceed 90 degrees F (32 degrees C), and night temperatures should drop below 70 degrees F (21 degrees C), but not lower than 55 degrees F (13 degrees C). Optimum night temperature is 59-68 degrees F (15-20 degrees C). At 40 degrees F (5 degrees C) some tomato varieties show tissue damage not readily visible. Greenhouse Pests: Greenhouse tomato pests such as whiteflies, mealybugs, aphids, and spider mites can be controlled with insecticidal soap up to one day before harvest. Whiteflies, winged-aphids, and leafminers are attracted to and trapped by sticky-yellow traps. Known disease tolerance or resistance is indicated in parentheses after the variety name. V, F, and N at the end of a variety name indicate known resistance to verticillium wilt, fusarium wilt, and nematodes, respectively. Many factors affect disease resistance and results may vary from region to region and from season to season. Disease resistant varieties will not be totally disease-free but they will resist or tolerate disease better than other varieties. Note that many heirloom tomatoes have not been extensively tested for disease tolerance either in the laboratory, or in extensive field trials - absence of disease resistance information in the variety description does not imply lack of resistance. See our Tomato Variety Guide for recommendations for disease-resistant, storage, and extra early varieties.